Fall 2016 has been busy for the UMass Board of Trustees. Although new to the Board, I have learned a lot about the way it works and what types of issues it handles. The Board governs the UMass system and its policies. It is largely a board of approval, usually acting as the last step before a major policy is enacted and rarely interfering with the operations of an individual campus. One major point that the Board approves is student tuition and fees. Every summer, the Board votes to approve or deny an increase. This summer, the Board voted 11-2 in favor of an increase that averaged 5.8% (or a $756 increase) across its five campuses, translating to an average tuition of $13,862 for an in-state undergraduate student. I voted against these increases and voiced my concern for the alarming national trend of debilitating student debt. The reason for this increase was largely due to lack of state funding. According to some sources, Massachusetts is the 48th ranked state when it comes to state funding for public higher education. Although known for its elite, private colleges, Massachusetts clearly lacks support for improving the quality and accessibility of its state universities. As a result, students and their families are forced into more and more debt. Unfortunately, it’s extremely unlikely that state funding will increase adequately in future years. This means that tuition and fees will continue to increase. However, after being approved by the Legislature, UMass began benefitting from tuition retention starting July 2016. In-state tuition previously went to the state treasury and was then distributed back to the UMass campuses through a line-item budget. With tuition retention, now in-state tuition remains a part of the University budget and does not go to the state. Tuition retention has led to the restructuring of student bills. Before tuition retention, UMass had would increase its fees in order to compensate for losing its tuition to the state (UMass could keep the money generated from fees). This was why UMass had a “high fee, low tuition” model. Now, with tuition retention, UMass has switched to a more common “high tuition, low fee” model. For those students who have John and Abigail Adams scholarships, which were intended to cover the cost of in-state tuition, those scholarships will no longer be able to pay for full tuition. As of now, the scholarship will continue to cover the cost of tuition prior to the implementation of tuition retention. It will only cover a fraction of tuition. Other policies that the Board has approved this semester include the Non-Discrimination and Harassment Policy, which had not been updated since 1992, and a Sustainability Policy, which outlines ten sustainability guidelines that each campus should follow. President Meehan, Chair Woolridge, and other UMass administrators met with students on December 8th to discuss sanctuary campuses. During discussions with students, UMass administration has remained neutral in declaring sanctuary campus status, citing reasons such as the potential loss of federal funding to the UMass system (as becoming a sanctuary campus would conflict with executing federal deportations). They also note the strength of the pre-existing protections that UMass already provides its students. Despite avoiding declaring UMass campuses as sanctuary campuses, administration is extremely conscious of student sentiment and promises to continue to support and protect all students to the highest reasonable degree. Some additional updates is the University of Massachusetts School of Law at Dartmouth receiving ABA accreditation, and the Board approving various construction and renovation projects across the UMass campuses. The University of Massachusetts School of Law at Dartmouth is the state’s only public law school, offering a law degree at a much more affordable price than private school equivalents. This accreditation symbolizes national recognition, affirming its quality and boosting the likelihood of graduates obtaining a license and getting a job. The construction and renovation projects help address deferred maintenance issues, problems with student accessibility in certain outdated buildings, and obsolete teaching and researching environments that hinder students’ ability to learn and experiment. As the second half of my one-year term on the Board approaches, I will continue to stay committed to fighting for affordability, remaining vocal on the Board and ensuring the student voice is heard, and maintaining transparency. To stay involved and receive periodic updates, like my page at Facebook.com/TrusteeReed and check the Connector for articles I write. 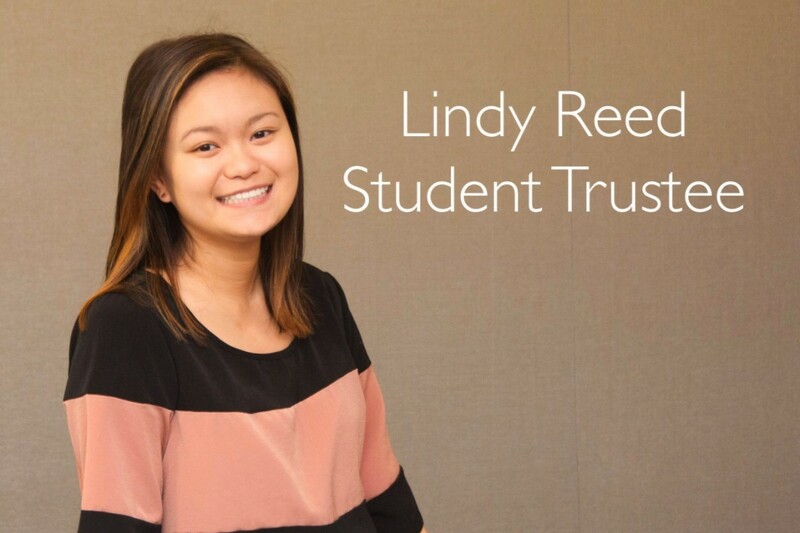 Lindy Reed is a junior English and history double major, a member of the Student Government Association and a member of the UMass Board of Trustees.